This is a large and beautiful looking cigar. It bears a classic refinement in appearance and when I smoke it. The wrapper is medium brown with an oily and rich looking vein structure. The experience is smooth, complex and aristocratic with a cool edginess to it. I sniff and detect sweet cedar and leather. There is cocoa, coffee, deep rubbed leather, baking spices, and black pepper. I cut the cap and light it up. Red pepper! Cocoa. Dark espresso. Smoke pours from the foot in such volume that I cannot see the laptop screen with the cigar in my mouth. A natural sweetness emerges. Sort of fruity, like me. Neither of them overpower the other. It’s an excellent match. Dillon’s is very satisfying. A refined, well crafted taste that’s a cut above the rest. It causes me to re-define the upper end of gins, with its delicate and refined aromatics and notes of juniper, floral, and botanicals. This encounter was straight. 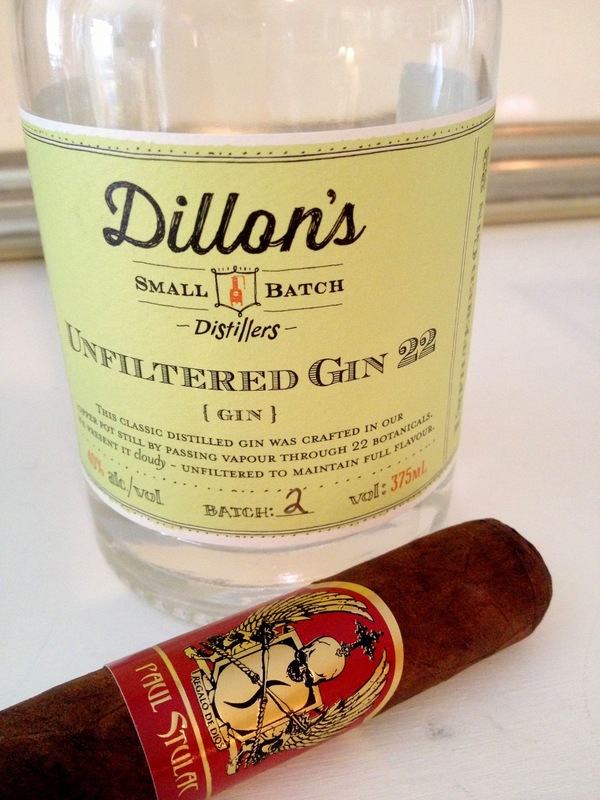 The next couple of experiences were as Dillon’s Gin & Tonic.